for We Are All ONE! "A CIVIL RIGHTS MOVEMENT FOR THE SOUL"
Humanity’s Team Canada is part of Humanity's Team Worldwide, a Global Spiritual Movement whose purpose is to communicate and demonstrate the timeless truth that We Are All One, with the Divine and all life – caring for each other and the world we share – so that people's actions reflect this profound understanding within a generation, and live and interact accordingly. We believe that living this truth is essential to solving the most chronic and acute world problems and vital to creating a sustainable world of peace, harmony and happiness. 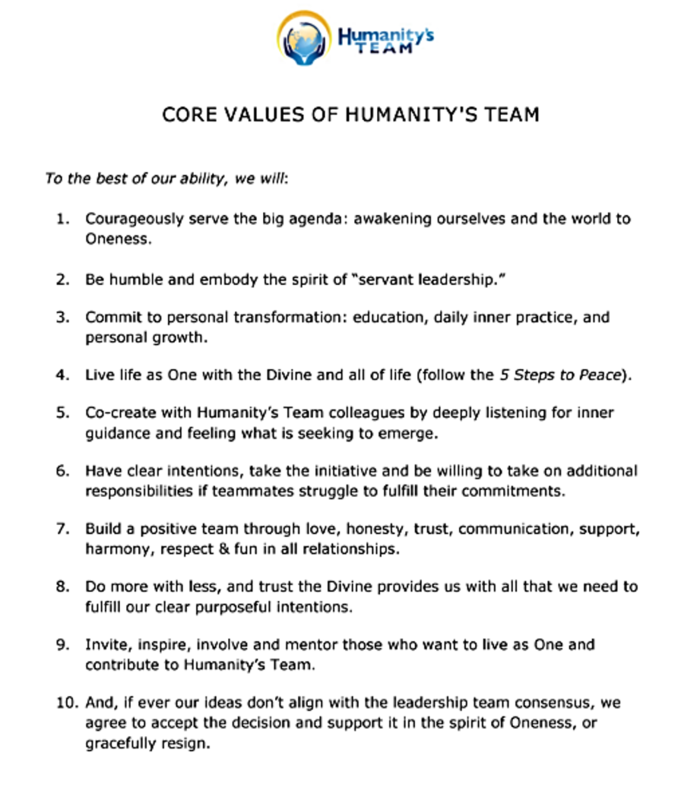 From global strategies to community grassroots initiatives, Humanity’s Team Worldwide and its regional chapters focuse on cultivating the growth of a New Spirituality that recognizes life’s unity and humanity’s Oneness, while respecting the wondrous diversity inherent in us all. Dubbed “A Civil Rights Movement for the Soul,” the movement counts today over 550,000+ adherents from more than 150 countries on six continents. Steve Farrell, President & Worldwide Executive Director of Humanity's Team, with co-founder Neale Donald Walsch, author of Conversation with God series that have onset the evolution revolution of humanity. Our day to celebrate unity in our diversity with celebrations across the globe in remembrance of Who We Really Are while our virtual Summit hosts renowned speakers sharing how Oneness can be realized and expressed in daily life, so that our global society blossoms into greater health, harmony and happiness. Oct 24. Free attendance! The Living in Oneness Summit focuses on how we can embrace the Divine within so we restore our joy, play, grace and beauty. Our speakers will specifically address how we live as One: in our own life, with our significant other, parenting our children, in the workplace and as a public service leader. A global movement seeking to bring an awareness that could change the world as we recognize that most human and world challenges root on beliefs we created about God, life, ourselves, our true relationship to God and to each other, and the purpose of Life Itself. A weekly Book club is part of the program. Named “A Great NonProfit” for three years running, we are all dedicated to bringing unity, compassion, and community to our divisive and conflicted world, directly assisting those living on the margins of our global society through outreach relief’s projects. We are deeply motivated by our simple, but profound, message about life and living: We Are All One! Jointly created by Humanity’s Team, The Club of Budapest, The Goi Peace Foundation and the Fowler Center for Business, this Declaration commits its signatories to its 7 essential principles defining a new business standard that will dramatically increase economic prosperity, heal the environment and improve human wellbeing. For those who feel drawn to connect with their deepest purpose, along with loving, spiritually consecrated beings, and express, embody and awaken to the Divine Source of all life. 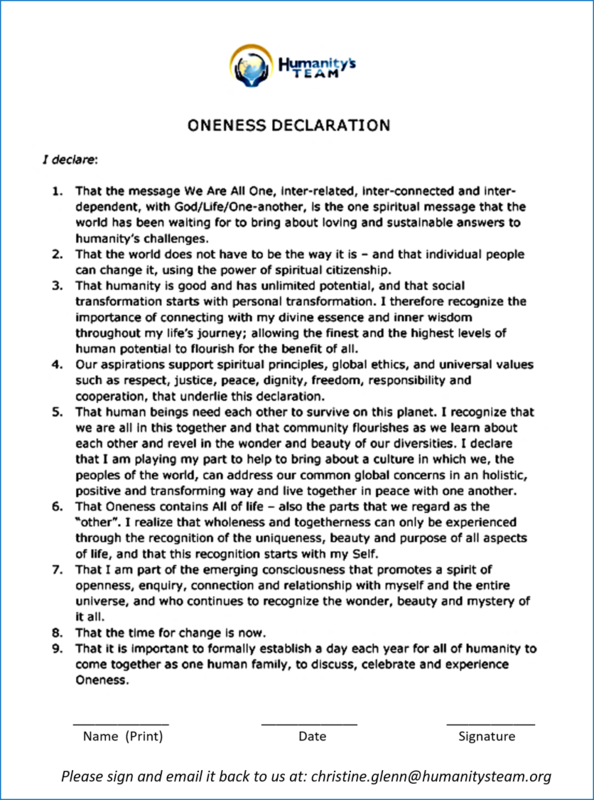 Collaborating with other spiritual activism’s leaders worldwide, we share a common commitment to awakening and living in Oneness and compassion. An on-going initiative to end violence in the name of God, asking of all people of every faith to take a stand with a common message: God is Love, and a God of Love does not support hatred, revenge or violence. We urge all to focus on nurturing Life instead, supporting what is in our cultures of Life Enhancing, Life Supporting and Life Sustaining. We embody oneness with a profound respect for cultural diversity and responsibility for all of life. 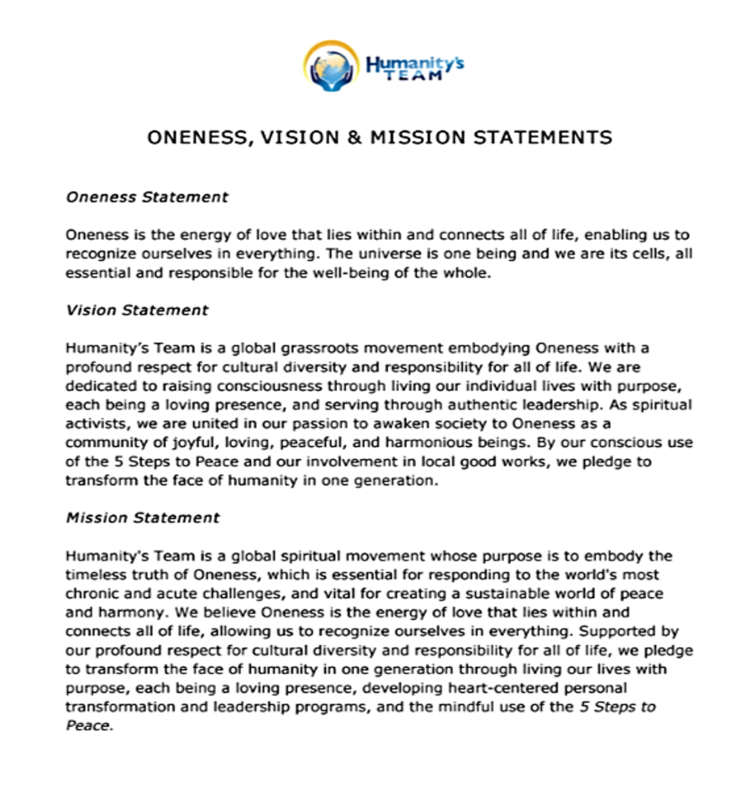 By our conscious use of the 5 Steps to Peace, we pledge to change the face of humanity in one generation, as we love our life with purpose, being a loving presence, and serving through authentic leadership. Available for download. Our Oneness in Twelve Spheres of Life initiative is based on the Wheel of Co-Creation and the ’12 around 1’ model of Barbara Marx Hubbard, a powerful representation of the whole-system shift. The 12 societal spheres comprise the full list of the basic functions of any community; a principle representing the stability in nature.